Partition Systems built its reputation on outstanding performance and quality, one Incredible Space at a time. We serve international clients in industries from commercial and industrial design to manufacturing and government with wall systems that offer the widest selection of features, finishes and flexibility. Our systems can be configured to existing wall infrastructures or developed from the ground up. From our first modular wall to today’s plug-and-play innovations, we have helped our international design and corporate clients lead the evolution of their office environments. We offer a diversified product selection that considers function as well as design aesthetic at competitive prices. We are proud to provide a quality product that exceeds market standards. Partition Systems has been creating business friendly environments since 1970. Our mission is to provide each of our clients the right choices to help their organization succeed. 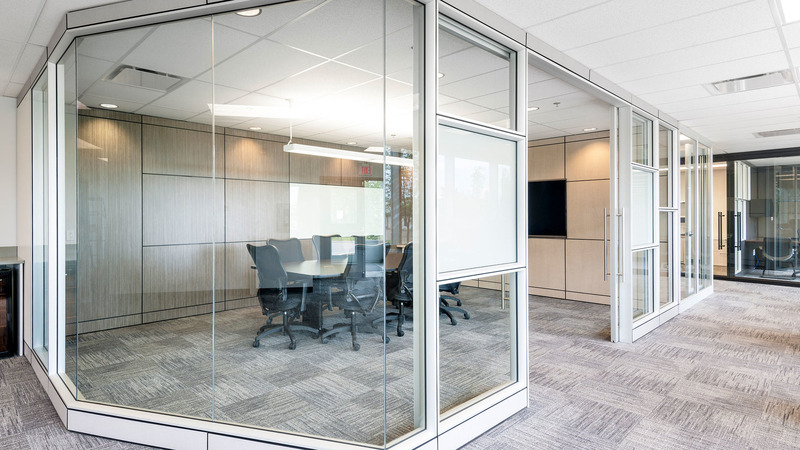 Partition Systems creates office environments and additions that stand the tests of time, traffic and style. We can help you achieve your goals through effective communication and product matching with a history of producing quality and proven systems. We thank you for the opportunity to submit a proposal on our movable wall system. PSL Partition Systems Ltd is a privately owned and operated company with 50 years of experience in wall system production. Our administrative headquarters and production facility are located in Edmonton, Alberta. We have our own distribution centers in Edmonton, Calgary and Vancouver with dealers located in Toronto, Ottawa, Winnipeg, Regina, Saskatoon, and Victoria. Our team is dedicated to excellence in workmanship. With a project list that spans the globe, we are able to identify needs and match products with any given opportunity. Our project team has years of experience and service in providing movable walls. Environmentally responsible user groups have pushed the design demands of wall systems into a direction of corporate responsibility while maintaining function and value. We take pride in our efforts to not only be an environmentally responsible manufacturing facility but also continuing in our efforts to provide effective systems that offer environmentally sustainable options. Our Wall Systems are engineered with maximum flexibility in mind. We have taken our history of production success and product development, using tried and proven technology in order to create it. All of our wall systems offer a fully custom, modular and movable solution with features that cater to the ever-changing demands placed on business today. 1973 Company began lamination of drywall and other panel substrates. We are the largest panel laminator in Western Canada. 1973 Developed our own Patented PS-350 gravity lock, non-progressive demountable wall system, Canada wide distribution with regional offices in Toronto, Calgary, Edmonton and Vancouver. We continue to make improvements to this system, with the most recent being the introduction of the All Aluminum door frame system in 2001. 1980 Developed the Lay-in Ceiling Panels, Laminated vinyl, fabric or plain paper finish, High impact and damage resistant with excellent attenuation and light reflectance, Easy installation into ceiling suspension systems. 1986 Industrial Product Line launched, aimed at the mobile camps. 1991 Tree Stud Development, eliminating the horizontal v-channels that the clips hooked on to. 1996 Developed the Corporate Series, Unitized panel system. This continues to develop as we respond to customers’ requirements for unique features. 1998 Developed the World Wide Wall, Unitized panel system for industrial applications. Partitions Systems supplied over 7500 linear meters (24, 600 linear feet) of this product for the Vancouver Olympics. 2006 Developed the Executive Series, Unitized, Frame and Tile, Demountable wall system. 2010 Partition Systems Ltd. takes the next step in providing customer satisfaction by introducing Maxon Furniture Inc. Maxon Furniture Inc. is a world class office furniture manufacturer using the latest in lean manufacturing methods to produce products of outstanding quality, value and reliability. 2010 Introduced the FRP wall and ceiling panels, they are a new generation of Fiberglass reinforced liner panels. Engineered to provide maximum chemical and impact resistance as well as sanitation protection with minimum maintenance, without the high cost of other materials. 2012 Canadian Food Inspection Agency approval for Lay-in Ceiling Panels. 2016 Rebranded the “PS350 Series” to the “Classic Series”, the entire Industrial line to the Wrapid Series Systems. 2016 Introduced Bathroom Series, Your single source for washroom accessories, toilet partitions, lockers and other storage products.